ww2dbaseHMS Mauritius was a Crown Colony-class light cruiser, of the Fiji sub-class. 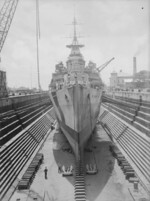 Although she was commissioned into British Royal Navy service in 1940, corrosion problems in the fire main caused by the internal degaussing system, caused her to undergo a series of refits at Simonstown in South Africa, Singapore, and Plymouth in Britain. In 1942, she joined the Eastern Fleet. In Apr 1943, she was reassigned to the Mediterranean Fleet, where bad luck followed her, this time in the form of damage from grounding. After repairs were done in Jun 1943, she supported the Allied landings in Sicily and Salerno in Italy. In late 1943, she patrolled the Bay of Biscay against French and German blockade runners. In Jan 1944, she returned to Italy in support of the landings at Anzio. In Jun 1944, she supported the landings at Sword Beach in Normandie, France, followed by patrols off the coast of Bretagne. In late 1945, as a part of the Home Fleet, she patrolled the North Sea and escorted carriers. In Feb 1945, she entered the Cammell Laird shipyard in Birkenhead, England, United Kingdom for refitting, and the war would end while she was in the yard. She returned to service in Mar 1946, serving in the Mediterranean Sea until 1948. After a brief period out of commission, she was recommissioned in 1949 for service in the Mediterranean Sea and the Indian Ocean. Returning to Britain in Dec 1951, she was placed in reserve. She was sold for scrap in 1965. 20 Dec 1937 The British Royal Navy issued the order for the light cruiser to be named HMS Mauritius. 31 Mar 1938 The keel of cruiser HMS Mauritius was laid down by Swan Hunter at Newcastle upon Tyne, Tyne and Wear, England, United Kingdom. 19 Jul 1939 HMS Mauritius was launched at Newcastle upon Tyne, Tyne and Wear, England, United Kingdom. 4 Jan 1940 HMS Mauritius was commissioned into service. 30 Aug 1940 Captain Leicester Charles Assheton Curzon-Howe was named the commanding officer of HMS Mauritius. 21 Jan 1941 Commander Arthur Reid Pedder was named the commanding officer of HMS Mauritius. 1 Feb 1941 Captain William Derek Stephens was named the commanding officer of HMS Mauritius. 22 Mar 1943 Captain William Wellclose Davis was named the commanding officer of HMS Mauritius. 14 Aug 1944 HMS Mauritius sank German minesweeper Sperrbrecher 157 off France. 22 Aug 1944 HMS Mauritius sank five German coastal patrol Vorpostenboot vessels off France. 23 Oct 1944 Captain Charles Alfred Evelyn Stanfield was named the commanding officer of HMS Mauritius. 27 Jan 1945 After sundown, HMS Diadem and HMS Mauritius engaged in combat with German destroyers in the North Sea; German destroyer Z31 was heavily damaged during the engagement, but would survive to return to port. 6 May 1949 HMS Mauritius was recommissioned into service. 19 Dec 1951 HMS Mauritius arrived at Chatham, Kent, England, United Kingdom. 27 Mar 1965 HMS Mauritius arrived at Inverkeithing, Scotland, United Kingdom to be scrapped by the firm T. W. Ward Limited. I have a picture of a crossing the line certificate for HMS Mauritius, dated 1941, signed by D A Holdsworth the recipient is G Garrod. In February 1945 HMS Mauritius refitted in the Gladstone dock at Seaforth, Liverpool. Just returned to South Africafrom a trip to Normandy and never realised that an HMS Mauritius was involved. My wife is from that island and it is fascinating to have learnt this fact and the info on it. Wish there was a model of it that I could build! Perhaps there is??? I'm looking for some information on my uncle William Wilden who was a crew member. He traveled from The Island Of Mauritius on the ship HMS Mauritius to Australia. They were transporting sugar.